Halloween definitely calls for serving up fun #Spookyfood to set a spooky mood! Whether you’re serving dinner before or after trick-or-treating -- or if you're planning a scary movie fest like I am -- today’s fun dish is a perfect addition to your Halloween menu. My friends at Frieda’s recently sent me some vibrant Stoke’s purple sweet potatoes to create some #Spookyfood to serve this Halloween. My mind immediately went to oven fries…served with a fun dipping sauce. The end result is my Spicy Purple Sweet Potato Oven Fries with Green Goo Dipping Sauce. The vibrant colors of the sweet potatoes and the dipping sauce are really fun…and the flavor is spicy good. All you need are some fun Halloween serving pieces and creepy decor to complete the Halloween mood! If you’ve never had Stoke’s purple sweet potatoes, you’re in for a real treat. 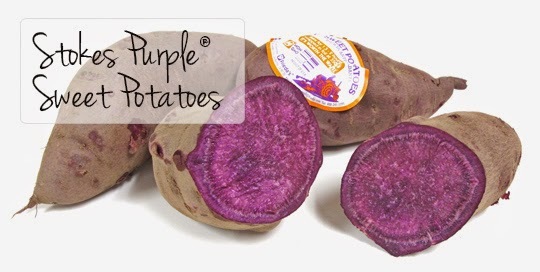 They taste similar to regular sweet potatoes, but they have a vibrant purple color and a richer flavor. I tossed the purple sweet potatoes in olive oil seasoned with herbs and spices. Just before going into the oven, I sprinkled them with coarse salt and fresh ground black pepper. While the fries baked, I whipped up the “green goo” dipping sauce to go on the side. This spicy dipping sauce is ranch dip made green by adding a puree of cilantro, green onion, and seeded jalapeno. The end result is definitely green…and monstrously good! This combo makes a great side dish paired with burgers or other sandwiches for your Halloween dinner. Sea salt and cracked black pepper to taste. Step 1: Preheat oven to 400. Line a large rimmed baking sheet with foil or parchment; set aside. Cut the sweet potato into matchstick pieces 1/2-inch wide. For even cooking, try to get the pieces even thickness. Combine the olive oil, parsley, garlic, cilantro, and chili powder in a large bowl. Add the sweet potatoes and toss to evenly coat with the seasoned oil. Step 2: Arrange the sweet potato fries on the rimmed baking sheet and sprinkle with salt & fresh ground pepper to taste. Bake for 20 minutes, then carefully flip them with a spatula. Add salt & pepper to the other side of the sweet potatoes and cook for an additional 10-15 minutes. The sweet potatoes should be browned and cooked through. Step 3: While the sweet potato fries bake, prepare the dipping sauce. Add the water, olive oil, and lime juice to a blender or small food processor. Top the liquid ingredients with the cilantro, jalapeno, and green onions. Process until the ingredients form a green puree. Add the sour cream, mayo, ranch dip mix, and green puree to a large mixing bowl. Stir well to combine and spoon into a bowl – I used a small metal “trick or treat” bucket from Dollar Tree! Step 4: To serve, place the sweet potato fries on a colorful Halloween platter. The plastic spiders I inserted among the fries are totally optional, but they're a fun surprise when you bring the fries to the table! Serve the sweet potato fries with the container of “green goo” on the side for dipping. 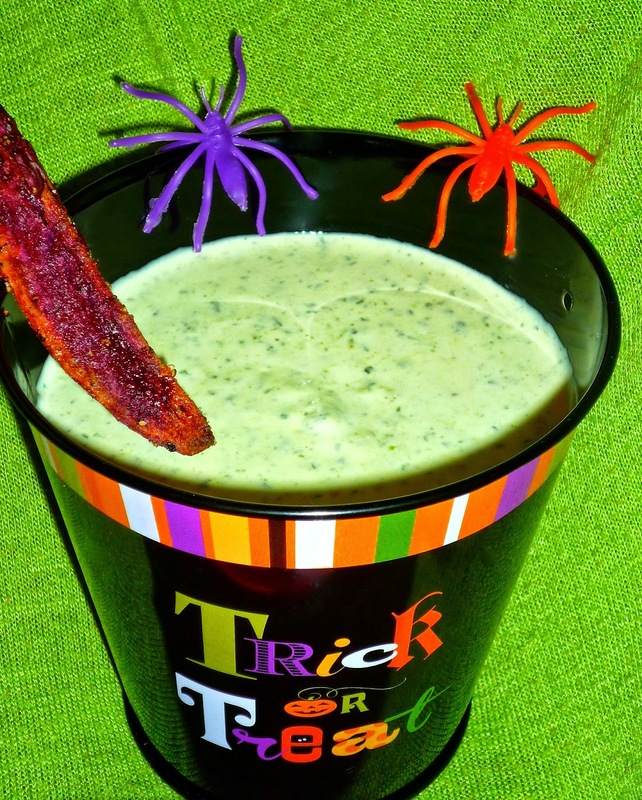 This is such a fun Halloween side – but it can be enjoyed anytime of the year! The sweet potato fries are lightly crispy, with a bright purple interior. The spice level is moderate, allowing the mellow sweetness of the potatoes take center stage. And the “green goo”? It provides an amazing burst of flavor! It’s moderately spicy and a little tangy -- with the familiar flavor of ranch shining through. If you prefer your dip on the milder side, use only half of a seeded jalapeno – or leave it out all together. I won’t tell! The leftover "green goo" also makes an excellent dip for crispy tortilla chips. I also like to use it as a spread on top of chicken sandwiches or cheeseburgers. I hope you'll give this fun recipe a try for Halloween...and let me know how your friends and family enjoy it! Disclosure: Frieda's provided me with Stokes purple sweet potatoes to facilitate this post. All opinions expressed are solely my own.